Creating art has always been a huge part of who I am…. Sketching, Painting; Crafting, Writing, Writing and Singing. You might categorize my training as “Hands-on-Learning”…. classes at the Creative Workshop of the U. of R. Memorial Art Gallery in Rochester New York, practice and using text books, while also noting the works of great artists, writers, poets; observing their varied techniques. 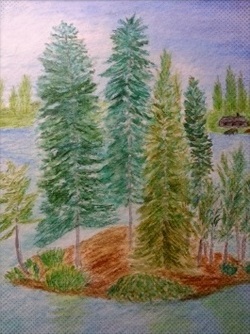 While I do not concentrate on any one particular subject, I do enjoy using such as animals, flowers, and buildings, with a fascination of lighthouses that to me represent historical/romantic structures; each unique. I take pleasure in learning new and interesting ways of producing my creations…. 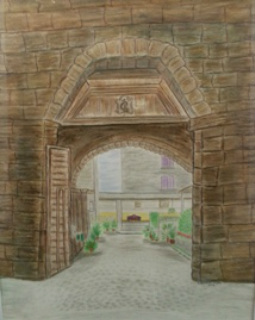 especially enjoy using Watercolor Pencils, Graphite Pencils, India ink and Acrylic Paints. You may often find me at my drawing board; working away to the music of classical composers as well as some country and folk artists.